On Sale Now! 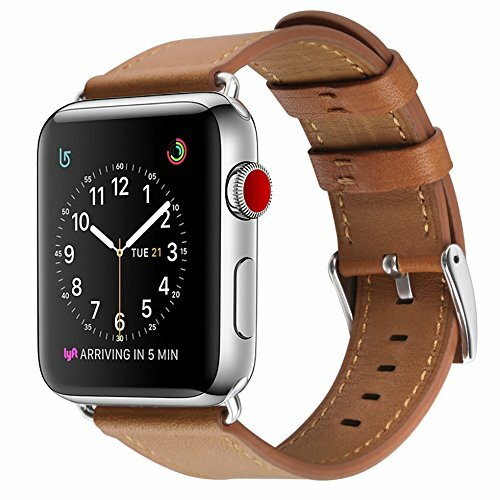 Save 9% on the Compatible with Apple Watch Band, COVERY 42MM Watch Band Genuine Leather Strap Stainless Metal Buckle Compatible Apple Watch Series 3, Series 2, Series 1, Sport & Edition- Brown by COVERY at All Company Mobiles. MPN: CYC-PiBR42. Hurry! Limited time offer. Offer valid only while supplies last. Production Description Color: Brown Size: 42mm Key Features: Brand: COVERY Adopt premium genuine leather, exquisite and durable. Timeless Classic Buckle is made of solid stainless steel and the clasp pin is enough stable and long.Never worry about the middle pin in the buckle disengages easily. Secure your watch with impeccable yet unpretentious style. 1. Watch are NOT included in package. SIZE: Designed for wrists 6.3 to 7.9 inches (160mm to 200mm). SECURITY: The adapters at both ends locks into watch interface precisely and securely. Easy to install and remove.The trusted stainless steel buckle ensure the stability. APPLICATION: Compatible Apple watch Series 1 Series 2 Series 3 sport & edition version 42mm. Designed for wrists 6.3 to 7.9 inches (160mm to 200mm).